Technology has brought amazing possibilities, but also damaging fragmentation, overload and distraction. Efforts to enhance productivity will fail if we continue to promote an “always-on” culture. Change comes from the top – CEOs and leaders need to modify their own behaviour for success to cascade down. Our new white paper reveals how businesses can succeed in a fractured world. 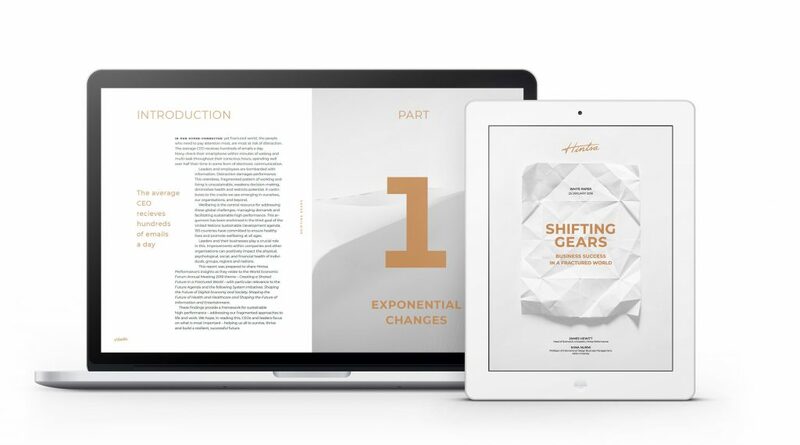 The white paper ‘Shifting Gears: Business Success in a Fractured World’ introduces a new framework for business performance, success and personal development. The report was released at the 2018 World Economic Forum. Fill in your details to get your copy. For an overview, see the short summary we’ve compiled for you. "There is no such thing as work-life balance, any more. Only life. In this hyper-connected and fast-paced world, we need to design better ways of living and working, if we are to thrive." See how we help our customers to reach the optimal level of performance. Read how we can guide you to enjoy better life and better performance.